Adisla tending to her crops at Hlaalu Farm. 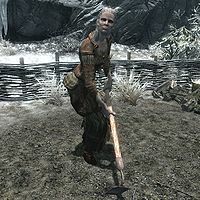 Adisla is an aging Nord farmer working the land for Belyn Hlaalu at his farm east of Windhelm. Adisla crawls out of her bed at 6am and spends the first hour of the day wandering around the farmhouse, then sits down and enjoys a one-hour breakfast. At 8am she heads outside and starts working the land. She keeps going for twelve hours until 8pm when she heads back inside for a one-hour dinner. She spends the rest of the evening performing miscellaneous tasks in the farmhouse until she finally goes to bed at midnight. She wears a set of clothes and a pair of boots. She carries an iron dagger to defend herself and a copy of the Hlaalu Farmhouse Key. Besides those, she also has a selection of lower-class items and gold in her inventory. Speaking to Adisla will have her provide a few comments about herself: "Starting to get too old to work all day, but hopefully Master Hlaalu will let me slow down a bit. ", "Every now and then someone from the city comes by. 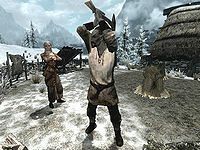 Think they aren't used to seeing a Nord working for a Dark Elf." and "Better to work in the cold than in the heat, I say. Though some sun would be nice." Adisla: "I was wondering if you had ordered the shipment of that frostwheat, sir." Belyn: "Yes, but that fool Endario can't get it in. I'll thrash him when I get back to the city, don't you worry." Adisla: "I wasn't wanting to get anyone in trouble, sir. Just wanting to get the new planting started, is all." Belyn: "Yes, wouldn't want to miss the lush summer we have ahead." Belyn: "Make sure the back fence is repaired. I swear I saw some skeevers in nibbling the leaves yesterday. " Adisla: "Oh, no skeevers out here, sir. They can't stand the cold." Belyn: "Maybe, but the way you burn through all that wood to keep the cabin toasty, they might mistake this place for Elsweyr." Adisla: "Sorry, sir. These old bones do like a bit of warmth in the evening. There's no need to make fun." Belyn: "You just need to remember that there's a war on, and firewood isn't cheap these days." Belyn: "So have you ever actually spoken to Captain Lonely-Gale?" Adisla: "By the gods, he's just a retired ship's captain." Belyn: "Maybe to you, but he's just so... his story is..."
Adisla: "He's just a guard captain. And not a very good one, at that." This page was last modified on 5 October 2013, at 15:50.